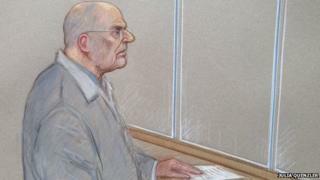 The offences Denning admitted were committed between 1967 and 1984. They were made up of 26 counts of indecent assault and three of indecency with a child. The charges he denies include indecent assault, indecency with a child and more serious sexual offences. Denning, who was first arrested by Yewtree detectives in June last year, was remanded in custody until his trial, which is expected to last up to two weeks. He was one of the original line-up on BBC Radio 1 when the station launched in 1967. He was also the first announcer heard on BBC Two when it took to the air in 1964.